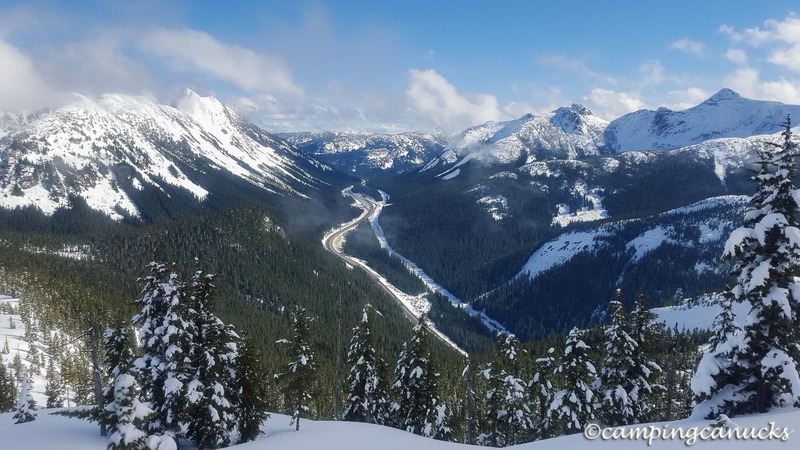 The Coquihalla Recreation Area is a location that we have enjoyed several times over the years for hiking, snowshoeing, and more recently camping and mountaineering. 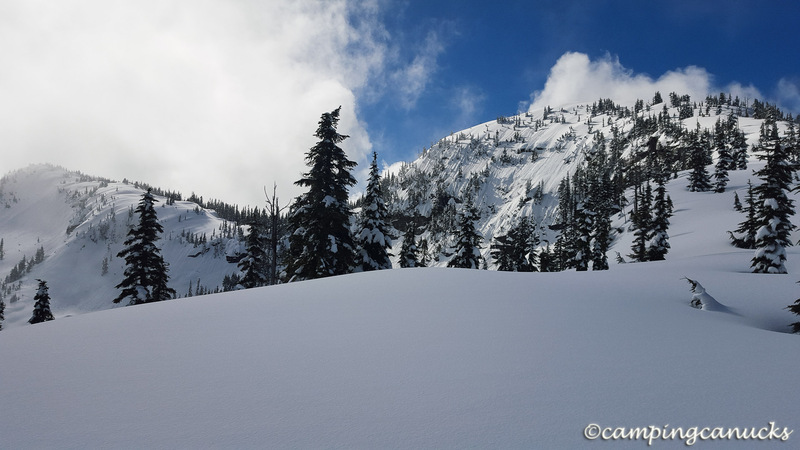 This year, we both snowshoed and camped on the Iago Peak Trail during the winter months. The trail starts at the Zopkios truck stop, which is also the winter parking area for the nearby Needle Peak Trail. A short walk from the bathrooms will bring you to the trees and the start of the trail. This is the spot where you really start to appreciate just how much snow can accumulate in this area but can vary quite a bit from year to year. 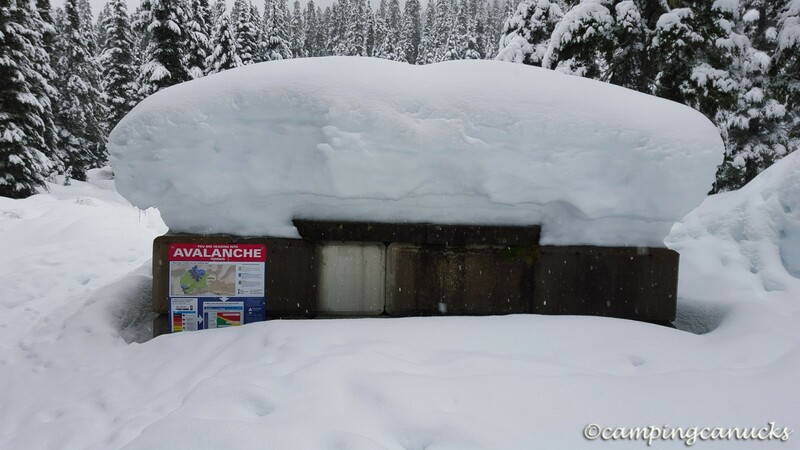 It should be noted that there is no real avalanche danger on this trail unless you were to wander off the trail and onto some of the slopes along the way. On sunny days, there are some great views of Yak Peak to be had at the start but when it’s cloudy, there is not much to be seen on most of the first part of the trail as it goes through the trees. 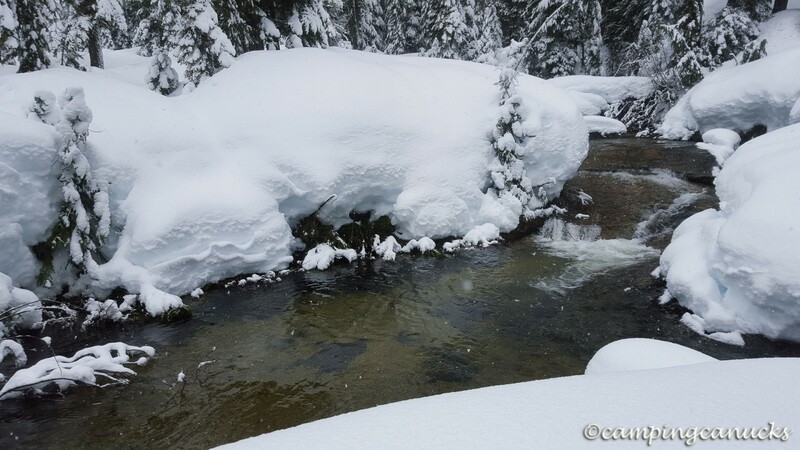 There are usually several open creeks and on our first trip this winter one of the creeks was missing a bridge, which meant jumping across that day. The last time out, however, someone had gone in and built a new bridge. On our last trip, we were on the lookout for a place to camp below the treeline in case conditions at the summit were too cold or windy. We found several likely locations along the trail and on our return from the summit we ended up using the largest meadows we came across to camp at. We were also able to build a snow cave big enough for us to hang out and cook in, since the snow was more then two meters deep. 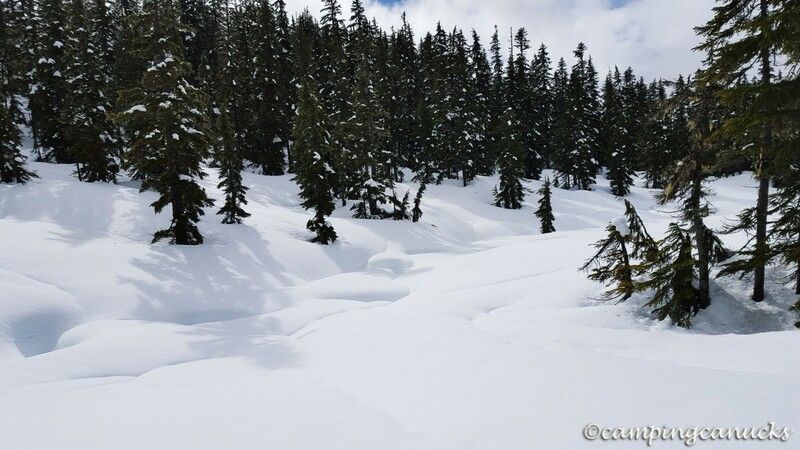 After passing the meadows on the way up, some route finding is often required in the winter if the trail has been covered by snow. There is flagging here and there but can be hard to spot at times. We have a track available for download to help find the path. 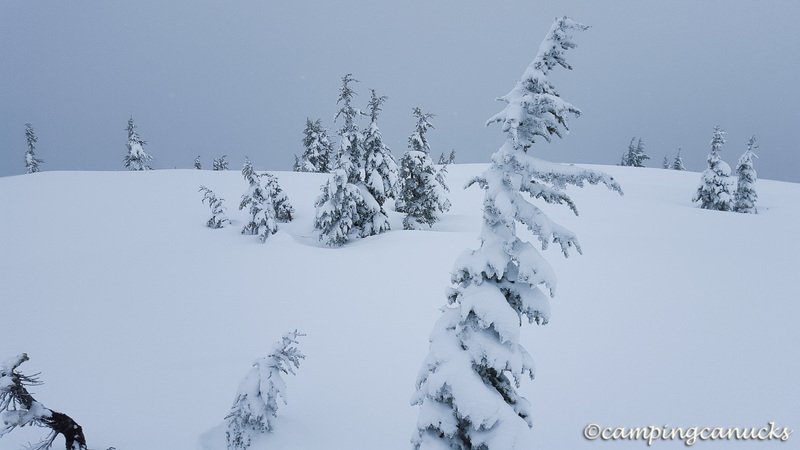 On both of our trips up this year, we had to break trail in heavy snow which proved to be quite a bit of effort. With a short climb out of the trees, the trail picks up along the ridge to the top. On clear days, this is where the best views of the nearby peaks really begin. On a cloudy day, though, it can be a pretty bleak trip to the top. It’s a relatively short haul up the ridge to the top but there are some steep sections here and there. Depending on how firm the snow is, we have gone straight up on some trips and have had to switchback our way up on others. On our most recent trip, we could see a lot of avalanches on either side of the ridge. The top of Iago Peak is quite flat and very exposed. On some trips, with the wind whipping at us, we have quickly turned around and just headed on our way back down. When the weather is nice, though, there are some great views to be had of many of the nearby peaks in the area. Those are the times in which it’s nice to have a break at the top and just enjoy the experience. The last time, we stuck an avalanche probe in the snow and there was more than 250 centimeters of snow at the top. The trip down is merely following your path up and is usually quite a bit easier. We expect that the trail is easy to follow in the summer but we have only been up in the snow at this point. 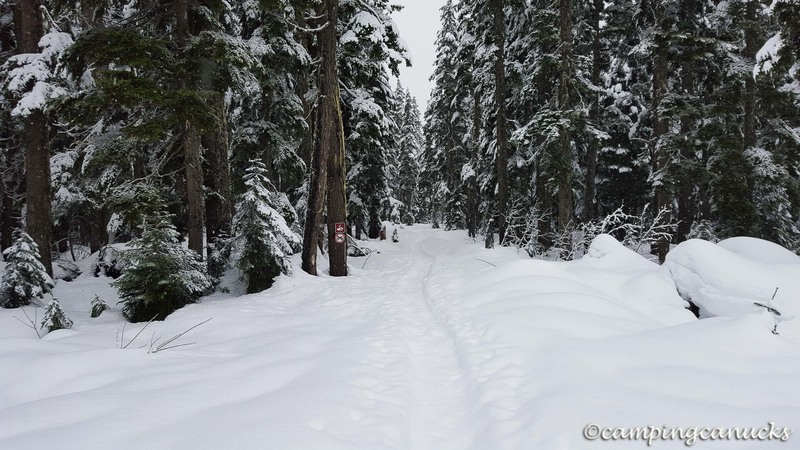 All said, the Iago Peak Trail is a bit over 12km return and can usually be done in three or four hours, depending on conditions. We have gone up in dry, powdery snow and in heavy, rain saturated snow. Needless to say, it’s an easier trip with drier snow. 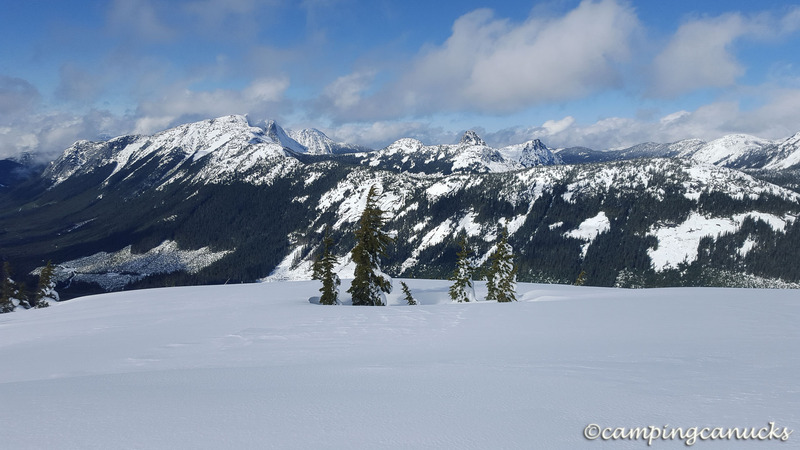 This does remain one of our favourite places to snowshoe and we expect that we’ll be back again some other time in the winter to enjoy the Iago Peak Trail. Thanks! I see you’ve been up there as well. It certainly is a nice trip on a sunny day.